1) Heat the ghee (or oil) in a heavy frying pan and stir-fry the garlic & ginger until golden, about 5 mins. 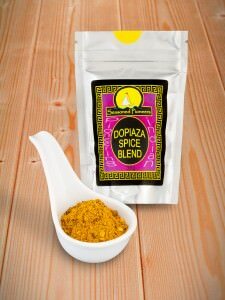 2) Add the Dopiaza Spice Blend and meat and stir-fry for a further 3 to 4 minutes. 3) Mix in tomatoes and salt, cover and simmer until meat is cooked and sauce thickened, adding water or stock as required if gets too dry (if using lamb, this will take an hour or so). 4) Mix in the yogurt, then add the raw onions, cover and bring to a high heat for up to a minute to generate steam. Turn off and leave covered for 5 minutes for onions to cook. 5) Check onions are cooked (should be crisp but sweet) and repeat steaming process if still raw. 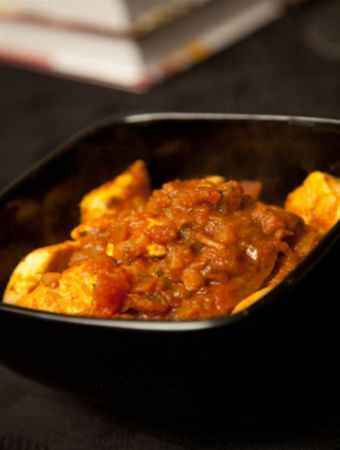 Garnish with coriander and serve hot with basmati rice (serves 4).